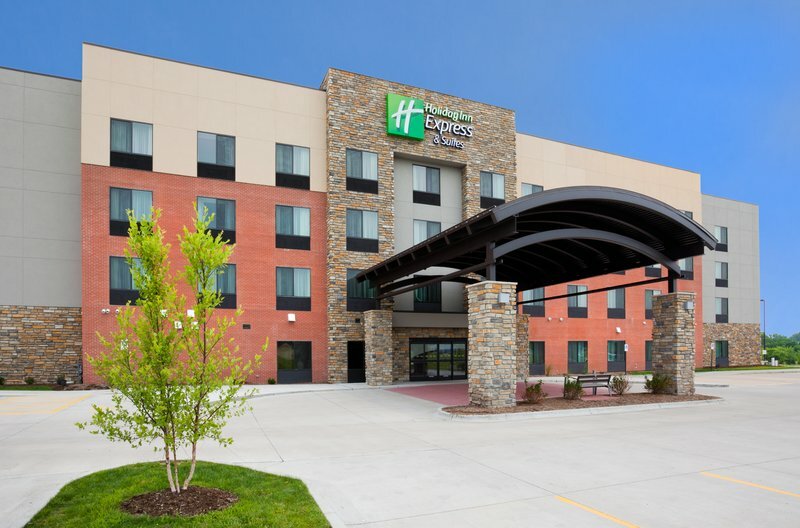 Welcome to the Holiday Inn Express & Suites Davenport; located in the exciting Quad Cities Area. Our hotel's convenient location is just minutes from Interstate 80, so you can take in all there is to enjoy in Davenport IA, Rock Island IL, Bettendorf, Iowa, and Moline, Illinois. Corporate travelers will love staying at our Davenport, IA hotel since we are close to some of the largest businesses in the area, including Kraft Heinz Company, Von Maur, and Isle Casino Hotel. We are also just a short drive to Rock Island Arsenal, Deere & Company, and Arconic. While staying at our hotel in Davenport, IA take in one of the many great attractions in the area including the Figge Art Museum, Rhythm City Casino, TBK Bank Sports Complex, John Deere Pavilion, and Putnam Museum and Science Center. If time allows, we hope you can see all that the Quad Cities has to offer: Niabi Zoo, Celebration River Cruises, and Iowa 80 Trucking Museum to name a few. When you are ready to sit down and eat, our hotel is located by some of the best restaurants in the area. Enjoy a meal at Thunder Bay Grill, Machine Shed, or Biaggi's Ristorante Italiano. If you are looking for some unique beverages, check out our local breweries and wineries: Bent River Brewing Company, Front Street Brewery, Wide River Winery, and Creekside Vineyards Winery. We hope you enjoy your stay in the Quad Cities at the Davenport Holiday Inn Express. Cafe D'Marie: Lunch destination offering a homespun menu of specialty drinks, panini and sweets in a warm ambiance. QC Coffee and Pancake House: Homestyle American breakfast and lunch favorites served in a lively, old school atmosphere. North Park MallNorthPark Mall is anchored by fantastic department stores including Dillard's, JCPenney, and Von Maur, and has a variety of both brand name and boutique retailers along with a wide range of quick service and sit down restaurants. Hidden Hills Golf CourseAn eighteen hole course highlighted by its four bonus holes, making it a twenty-two hole course. The total yardage from the tips, including the four bonus holes, is 7,300 yards. Emeis Golf CourseEmeis is a demanding 18-hole, 6500-yard course which plays to a par of 72. The facility is built on 155 acres of gently rolling terrain on the city's western boundary. Duck Creek Golf CourseDuck Creek is a beautiful 18-hole golf course which is 5,759 yards long and plays to a par of 70. Advanced tee-times are recommended. Minimum age for play on 18-hole and 9-hole courses is 8 years old. No 9-hole rates on weekends until afternoon. TPC Deere Run PGA Golf CourseTPC Deere Run s championship golf course is a destination for golfers in the Midwest. Located in the Quad Cities region of Western Illinois and just over a two-hour drive from Chicago. Red Hawk Golf CourseRed Hawk is an exciting 9 hole executive course located at the Red Hawk Golf Course facility in Davenport, IA. From the longest tees it presents 2,550 yards of golf for a par of 34. The course rating is 35.5 with a slope rating of 113. Rhythm City Casino ResortCasino & Resort with Slots and Video Poker, Table Games, four restaurants, two event rooms, and a spa on site. Niabi ZooZoo that has over 600 animals representing 200 species from around the world, all encompassed on more than 40 acres of picturesque forest preserve.